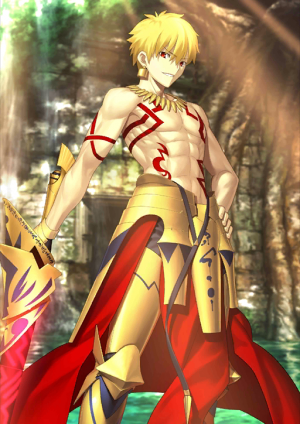 This Article is for the adult 5★ version of Gilgamesh. 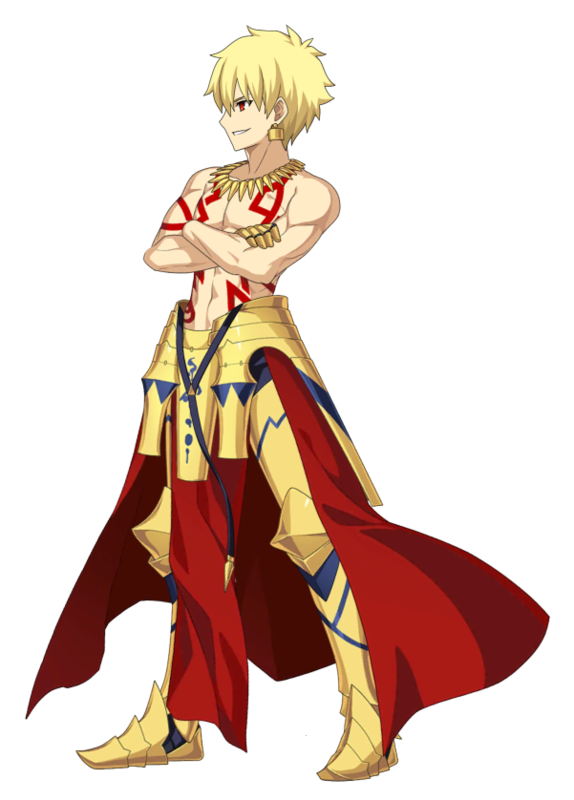 For 3★ young version see, Gilgamesh (Child); for 4★ version, see Gilgamesh (Caster). 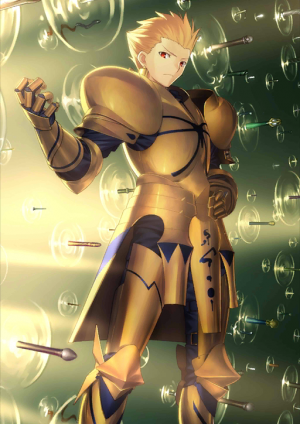 Increase your NP Strength by 30%. 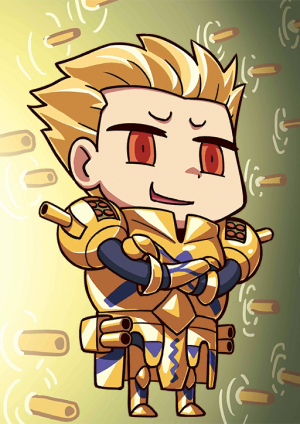 When equipped on Gilgamesh, Increase own NP damage by 30%. 30% Chance to increase critical damage by 10% when attacking (3 turns). Half-god, half-man king that ruled over the city-state of Uruk in Sumeria before the modern calendar. A king not just of legend but of one of mankind's oldest tales, "The Epic of Gilgamesh." Ruthless and merciless, he does not listen to others. He's a tyrant who sees his standards as absolute. This Heroic Spirit clearly overpowers all the others, and unleashes his overwhelming wealth like water. 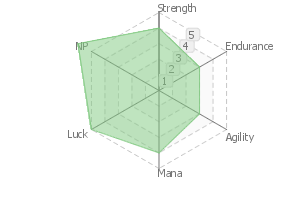 He has the highest affinity with divine spirits, but because he hates the gods it has been ranked down. A demi-god with 2/3 divinity and 1/3 humanity, he is matchless in his reign over the world. He is a supreme being who has obtained everything in existence. A key-shaped sword that connects to the Golden Capital. It bridges different spaces, and allows the user to freely take any treasure from the vault. The more riches the user accrues, the more powerful the attack. It's used as a normal attack in this game. Star of Creation that Divided Heaven and Earth. Crowned with the name of a Mesopotamian god, the sword Ea can cause a rupture in space. 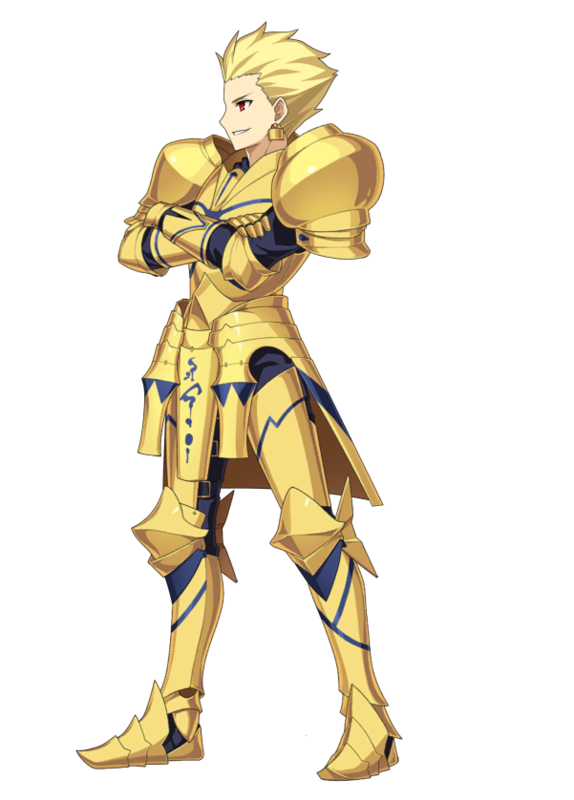 One of the most powerful Noble Phantasms, it is a sword that can "cut apart worlds." 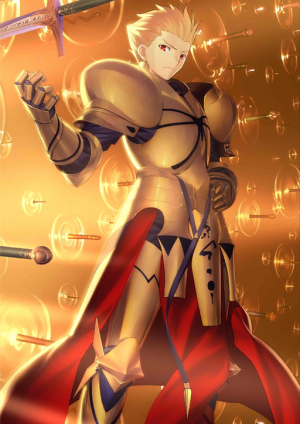 Gilgamesh is a treasure collector. He often says "I've already collected all the wealth in this world." He has gathered, stored, and sealed away every prototype of every technology known to man. and civilizations humans create are of value." 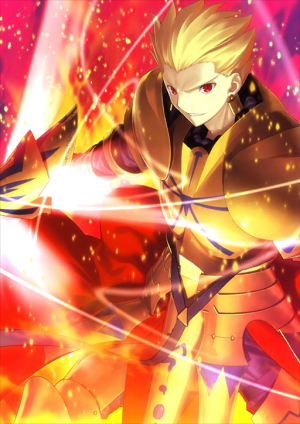 The king described in mankind's oldest epic poem, the "Epic of Gilgamesh", he is considered to have existed not only in legends but also in reality. His nature is cruel and heartless. Never hearing people's opinions, he is a tyrant who holds only his own standards as absolute. Despite possessing the greatest Divine Spirit aptitude, its rank was reduced as a penalty for disliking the gods. A sword-key that connects to the golden capital. It connects spaces and makes so that the tools inside the treasure vault can be freely taken out. A sword that tears the world to pieces, considered to be one of the summits even among many Noble Phantasms. His favorite phrase is "I've assembled all treasures in the land", but that is not anything like a metaphor. He has assembled, stored and sealed away every sample of technology that was developed in his age. His argument is: "Humans are foolish, but there is value in the tools, the civilization that humans create". 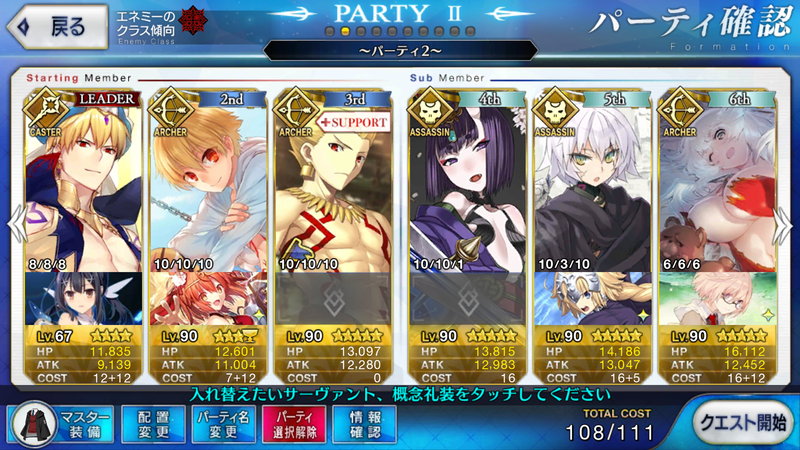 Despite the "Babylonian NPC" card being an unofficial art image edited by staff, it can still be seen in-game. This page was last modified on 30 December 2018, at 10:49.